The Homeschool Gossip: New Social Group for Kids have been created! New Social Group for Kids have been created! For those who love all things Anime & Manga! For those who love all things Pokemon! 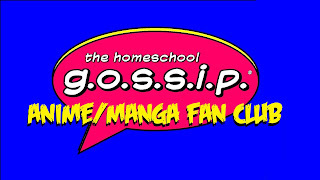 The Homeschool Gossip (THSG) social groups are open to Homeschool students and their parents who would like to share their love of a topic by sharing reviews, memes, pictures, quotes…and perhaps artwork. They are places to connect with other homeschoolers share a common interest and hopefully organize some events and activities to attend together. These are family friendly environments with fans of all ages. All content will need to be appropriate. “Appropriate” is a subjective term, so to explain, all posts will be looked at with parent-goggles :-). If anything posted is determined to not be appropriate it will be deleted. (Basically nothing too scary or too “grown-up”.) Disparaging comments will not be allowed, and will be deleted. These groups are here so we can connect, have fun and share something we have in common! Do you wish there was a social group for your students' interest? Let The Homeschool Gossip know!